This article is about the year 1949. January 1 – A United Nations-sponsored ceasefire brings an end to the Indo-Pakistani War of 1947. The war results in a stalemate and the division of Kashmir, which still continues as of 2019. January 2 – Luis Muñoz Marín becomes the first democratically elected Governor of Puerto Rico. January 4–February 22 – A series of winter storms in Nebraska, Wyoming, South Dakota, Utah, Colorado and Nevada, with winds of up to 72 mph, cause tens of thousands of cattle and sheep to perish. January 4 – The RMS Caronia of the Cunard Line departs Southampton for New York, on her maiden voyage. January 9–January 12 – The Los Angeles area is hit with a massive snow storm. January 11 – The first "networked" television broadcasts take place, as KDKA-TV in Pittsburgh, Pennsylvania goes on the air, connecting the east coast and mid-west programming. January 16 – Şemsettin Günaltay forms the new government of Turkey. It is the 18th government, last single party government of the Republican People's Party. January 17: Beetle in U.S.
January 19 – The Poe Toaster first appears, at the grave of Edgar Allan Poe. 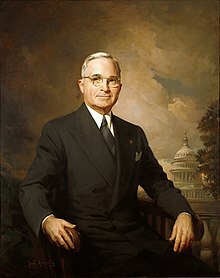 January 20 – Harry S. Truman is sworn in for a full term, as President of the United States. The Council for Mutual Economic Assistance (CMEA or COMECON) is established by the Soviet Union, and other communist nations. The first Emmy Awards are presented, at the Hollywood Athletic Club. In the first Israeli elections, David Ben-Gurion becomes Prime Minister. Australian citizenship comes into being. The Constitution of India is prepared. January 31 – Forces from the Communist Party of China enter Beijing. Rationing of clothes ends in Britain. Belgian astronomer Jean Meeus asserts that the orbits of all the planets of the Solar System are within the same 90° arc of the Solar System, on this date. The next time it is thought this will occur is on May 6, 2492. February 10 – Arthur Miller's tragedy Death of a Salesman opens at the Morosco Theatre in New York City, and runs for 742 performances. February 11 – The London Mozart Players perform their first concert at the Wigmore Hall, London. February 13 – António Óscar Carmona is re-elected president of Portugal, for lack of an opposing candidate. February 17 – Chaim Weizmann begins his term, as the first President of Israel. February 19 – Ezra Pound is awarded the first Bollingen Prize in poetry, by the Bollingen Foundation and Yale University. Cincinnati Gardens opens in Cincinnati. Grady the Cow, a 1,200-pound cow, gets stuck inside a silo on a farm in Yukon, Oklahoma, and garners national media attention in the United States. February 28 – Margaret Roberts, the future Margaret Thatcher, is adopted as the Conservative candidate for Dartford. She will go on to fight two elections in the constituency unsuccessfully, in 1950 and 1951. February 26 – The Revolutionary Communist Party of India stages attacks at Dum Dum. World heavyweight boxing champion Joe Louis retires. Indonesia seizes Yogyakarta from the Dutch. March 2 – The B-50 Superfortress Lucky Lady II (under Captain James Gallagher) lands in Fort Worth, Texas, after completing the first non-stop around-the-world airplane flight (it was refueled in flight 4 times). March 17 – The Shamrock Hotel in Houston, Texas, owned by oil tycoon Glenn McCarthy, has its grand opening. March 20 – The Chicago, Burlington and Quincy, Denver and Rio Grande Western and Western Pacific railroads inaugurate the California Zephyr passenger train between Chicago and Oakland, California, as the first long distance train to feature Vista Dome cars as regular equipment. March 21 – WTVJ signs on the air in Miami, Florida, as the first station in the state. March 24 – The 21st Academy Awards Ceremony is held. The movie Hamlet wins the Academy Award for Best Picture. March 26 – The first half of Giuseppe Verdi's opera Aida, conducted by legendary conductor Arturo Toscanini, and performed in concert (i.e. no scenery or costumes), is telecast by NBC, live from Studio 8H at Rockefeller Center. The second half is telecast a week later. This is the only complete opera that Toscanini ever conducts on television. United States Secretary of Defense James Forrestal resigns suddenly. English astronomer Fred Hoyle coins the term Big Bang during a BBC Third Programme radio broadcast. March 30 – The anti-NATO riot takes place, prompted by the decision of the Icelandic parliament to join the newly formed NATO. March 31 – The former British colony of Newfoundland joins Canada, as its 10th province. April 4 – The North Atlantic Treaty is signed in Washington, D.C., creating the NATO defense alliance. April 7 – Rodgers and Hammerstein's South Pacific, starring Mary Martin and Ezio Pinza, opens on Broadway, and goes on to become R&H's second longest-running musical. It becomes an instant classic of the musical theatre. The score's biggest hit is the song "Some Enchanted Evening". April 8 – Kathy Fiscus, 3½ years old, dies from falling down an abandoned well in San Marino, California. April 14 – ON this day, the N'Ko alphabet is held to have been completed by Solomana Kante. April 15 – KPFA, the flagship station of the Pacifica Foundation, begins broadcasting in Berkeley, California. April 18 – The Republic of Ireland formally becomes a republic, and leaves the British Commonwealth. April 20 – Royal Navy frigate HMS Amethyst goes up the Yangtze River, to evacuate British Commonwealth refugees escaping the advance of Mao's Communist forces. Under heavy fire, she grounds off Rose Island. After an abortive rescue attempt on April 26, she anchors 10 miles upstream. Negotiations with the Communists to let the ship leave drag on for weeks, during which time the ship's cat Simon raises the crew's morale. April 23 – Chinese Communist troops take Nanjing. April 26 – Transjordan changes its name, to the Kingdom of Jordan. The 1949 Commonwealth Prime Ministers' Conference issues the London Declaration, enabling India (and, thereafter, any other nation) to remain in the Commonwealth despite becoming a republic, creating the position of 'Head of the Commonwealth' (held by the ruling British monarch), and renaming the organization, from the 'British Commonwealth' to the 'Commonwealth of Nations'. Former First Lady of the Philippines Aurora Quezon, 61, is assassinated while en route to dedicate a hospital in memory of her late husband; her daughter and 10 others are also killed. May 1 – Nereid, a moon of Neptune, is discovered by Gerard Kuiper. May 4 – Superga air disaster: A Fiat G.212 airliner of Avio Linee Italiane, carrying the entire Torino F.C. football team, crashes into the back wall of the Basilica of Superga, killing all 31 on board. May 5 – The Council of Europe is founded, by the signing of the Treaty of London. May 6 – EDSAC, the first practicable stored-program computer, runs its first program at Cambridge University. May 9 – Rainier III becomes Prince of Monaco, upon the death of his maternal grandfather Louis II. Israel is admitted to the United Nations, as its 59th member. Siam officially changes its French name to "Thaïlande" (English name to "Thailand"), having officially changed its Thai name to "Prated Thai" since 1939. May 12 – Cold War: The Soviet Union lifts the Berlin Blockade. May 16 – The Tokyo Stock Exchange resumes operations, after a four-year shutdown. The AFSA (predecessor of the NSA) is established. The Kuomintang regime declares Taiwan under martial law, which lasts until 1987. May 22 – After two months in Bethesda Naval Hospital, James Forrestal commits suicide, under circumstances that seem suspicious to many. May 23 – The Federal Republic of Germany is established. May 31 – The first trial of Alger Hiss for perjury begins in New York City, with Whittaker Chambers as principal witness for the prosecution, but will end in a jury deadlock (8 for, 4 against). June 5 – Thailand elects Orapin Chaiyakan, the first Thai female member of Thailand's Parliament. June 6 – With the passage of the Bodh Gaya Temple Act by the Indian government, Mahabodhi Temple is restored to partial Buddhist control. June 7–25 – Dock workers strike in the United Kingdom. Second Red Scare in the United States: Celebrities including Helen Keller, Dorothy Parker, Danny Kaye, Fredric March, John Garfield, Paul Muni and Edward G. Robinson are named in a Federal Bureau of Investigation report, as Communist Party members. George Orwell's dystopian novel Nineteen Eighty-Four is published in London. June 19 – Glenn Dunaway wins the inaugural NASCAR race at Charlotte Speedway, a 3/4 mile oval in Charlotte, North Carolina, but is disqualified due to illegal springs. Jim Roper is declared the official winner. June 24 – The first television western, Hopalong Cassidy, airs on NBC in the United States. June 29 – Apartheid: The South African Citizenship Act suspends the granting of citizenship to Commonwealth of Nations immigrants after 5 years, and imposes a ban on mixed marriages. July 1 – The Institute of Chartered Accountants of India is established. July 11 – Pamir is the last commercial sailing ship to round Cape Horn, under sail alone. July 15 – In an explosion at Prüm in Germany, the town is badly damaged and 12 people die. The explosion crater is one of the largest ever recorded. July 19 – The Kingdom of Laos is officially formed, but is not independent from the French Army. July 20 – Israel and Syria sign a truce to end their 19-month war. July 24 (St John's Day) – Eruption of the Cumbre Vieja volcano on La Palma begins. The de Havilland Comet, the world's first jet-powered airliner, makes its first flight, in England. Rhodesia beats the New Zealand national rugby union team (the All Blacks) 10-8, in an exhibition match in Bulawayo, the only non-Test nation ever to achieve this feat. July 30 – Legal aid in England and Wales begins. July 31 – Captain Kerans of HMS Amethyst decides to make a break after nightfall, under heavy fire from the Chinese People's Liberation Army on both sides of the Yangtze River, and successfully rejoins the fleet at Woosung the next day. August 3 – The Basketball Association of America and the National Basketball League finalize the merger that will create the National Basketball Association. August 5 – In Ecuador, the 6.8 ML Ambato earthquake kills more than 5,000, and destroys a number of villages. August 8 – Bhutan signs a Treaty of Friendship with newly-independent India, agreeing non-interference in internal affairs, but allowing India to "guide" its foreign policy (similar to the previous arrangements with the British administration in India). August 10 – the Avro Canada C102 Jetliner makes its first flight; it is the first jet airliner to fly in North America. August 12 – The Fourth Geneva Convention is agreed to. The Salvatore Giuliano Gang explodes mines under a police barracks, outside Palermo, Sicily. The Vatican announces that bones uncovered in its subterranean catacombs could be those of the apostle Peter; 19 years later, Pope Paul VI announces confirmation that the bones belong to this first Pope. Deportivo Saprissa enters Costa Rican soccer's first division. August 22 – The 1949 Queen Charlotte Islands earthquake is Canada's largest earthquake since the 1700 Cascadia earthquake. August 24 – The North Atlantic Treaty Organization is established. The Soviet Union tests its first atomic bomb, RDS-1 ("Joe 1"). Its design imitates the American plutonium bomb that was dropped on Nagasaki, Japan, in 1945. The retreat of the Greek Democratic Army to Albania, after its defeat at Mount Grammos, marks the end of the Greek Civil War. Six of the last sixteen surviving veterans of the Union Army, in the American Civil War, meet in Indianapolis. September 2 – Film noir The Third Man, with screenplay by Graham Greene and set in Allied-occupied Vienna, is released in the United Kingdom; it wins the 1949 Grand Prix at the Cannes Film Festival. Howard Unruh, a World War II veteran, kills 13 neighbors in Camden, New Jersey with a souvenir Parabellum P.08 pistol, to become America's first single-episode mass murderer. Allied military authorities relinquish control of former Nazi Germany assets back to Germany. September 7 – The Federal Republic of Germany is officially founded. Konrad Adenauer is the first federal chancellor. Albert Guay affair: A dynamite bomb destroys Canadian Pacific Airlines Douglas DC-3, in Quebec. Notorious World War II veteran Edwin Alonzo Boyd commits his first career bank robbery, in Toronto. September 13 – The Soviet Union vetoes United Nations membership for Ceylon, Finland, Iceland, Italy, Jordan and Portugal. September 17 – Canadian steamship SS Noronic burns in Toronto Harbour, with the loss of over 118 lives. September 23 – U.S. President Harry S. Truman announces that the Soviet Union has tested the atomic bomb. September 24 – László Rajk, ex-foreign minister of Hungary, is sentenced to death. September 25 – U.S. Christian evangelist Billy Graham started the Los Angeles Crusade (1949), his first great evangelistic campaign. It ran for eight weeks. During the campaign Graham spoke to 350,000 people and the event was subsequently described as the greatest revival since the time of Billy Sunday. After this crusade, Graham became a national figure in the United States. September 26 – Samuel Putnam publishes his new translation of Don Quixote, the first in contemporary English. It is instantly acclaimed and, in 2008, is still in print. The First Plenary Session of the Chinese People's Political Consultative Conference approves a design for the Flag of the People's Republic of China. Iva Toguri D'Aquino is found guilty of broadcasting for Japan as "Tokyo Rose", during World War II. October 1: People's Republic of China is founded. October 1 – The People's Republic of China is officially proclaimed. October 2 – The Soviet Union recognizes the People's Republic of China. October 3 – Albanian Subversion: First Anglo-American attempt to infiltrate guerillas into Albania; the operation is fatally flawed, by being under the control of double agent Kim Philby. October 7 – The German Democratic Republic (East Germany) is officially established. October 13 – Severe flooding hits Guatemala. October 14 – The Foley Square trial of Eugene Dennis and ten other leaders of the Communist Party USA ends in New York City (the longest trial in U.S. history to this date); all defendants are found guilty and all but one sentenced to five years of prison. October 16 – Greek Civil War ends with a communist surrender. October 17 – Chinese communist troops take Guangzhou. October 24 – The cornerstone of the Headquarters of the United Nations on Manhattan is laid. Battle of Kuningtou: Chinese communist troops fail to take Quemoy; their advance towards Taiwan is halted. 1949 Air France Lockheed Constellation crash: An Air France flight from Paris to New York crashes in the Azores on São Miguel Island, killing all aboard. Among the victims are violinist Ginette Neveu, and French boxer Marcel Cerdan. November 7 – Oil is discovered beneath the Caspian Sea, off the coast of the Azerbaijan Soviet Socialist Republic. November 12 – The Volkswagen Type 2 panel van is unveiled in Germany. November 15 – Nathuram Godse and Narayan Apte are executed for assassinating Mahatma Gandhi. November 17 – The second trial of Alger Hiss for perjury begins in New York, again with Whittaker Chambers as principal witness. November 24 – The ski resort in Squaw Valley, Placer County, California officially opens. November 26 – The Indian Constituent Assembly adopts India's constitution. November 28 – Winston Churchill makes a landmark speech in support of the idea of a European Union, at Kingsway Hall, London. The government of the Republic of China finishes its evacuation to Taiwan, and declares Taipei its temporary capital city. The United Nations Relief and Works Agency for Palestine Refugees in the Near East (UNRWA) is established as a United Nations agency. December 10 – Australian federal election, 1949: The Liberal/Country Coalition led by Robert Menzies defeats the Labor Government, led by Prime Minister Ben Chifley. Menzies is sworn in on December 19; his second stint as Prime Minister, he will hold the office for over 16 years until his retirement in 1966. Labor will not win office again until 1972, under Gough Whitlam. December 13 – The Knesset votes to move the capital of Israel to Jerusalem. December 14 – Traicho Kostov, ex-vice prime minister of Bulgaria, is sentenced to death. December 15 – A typhoon strikes a fishing fleet off Korea, killing several thousand. December 17 – Burma recognises the People's Republic of China. December 18 – In the American National Football League, the Philadelphia Eagles defeat the Los Angeles Rams 14-0, to win the championship. December 27 – Queen Juliana of the Netherlands grants Indonesia sovereignty. December 29 – KC2XAK of Bridgeport, Connecticut becomes the first Ultra high frequency (UHF) television station to operate a daily schedule. December 30 – India recognizes the People's Republic of China. The Malta Labour Party is founded. This is the first year in which no African-American is reported lynched in the United States. Fernand Braudel's La Méditerranée et le Monde Méditerranéen à l'Epoque de Philippe II is published. The Currywurst is invented in Berlin. D. R. Kaprekar discovers the convergence property of the number 6174. ^ "'Big bang' astronomer dies". BBC News. 2001-08-22. Archived from the original on 2008-12-08. Retrieved 2008-12-07. ^ Croswell, Ken (1995). "Chapter 9". The Alchemy of the Heavens. Anchor Books. ISBN 0-385-47213-7. ^ Mitton, Simon (2005). Fred Hoyle: a Life in Science. Aurum Press. p. 127. ISBN 1-85410-961-8. ^ "Pioneer computer to be rebuilt". Cam. 62: 5. 2011. ^ "Year by Year 1949". History Channel International. ^ "Constitution of India". Archived from the original on 2003-12-05. Retrieved 2003-11-27. ^ "Address given by Winston Churchill (London, 28 November 1949)". cvce.eu. Retrieved 2017-03-28. ^ Boardman, Barrington (1988). From Harding to Hiroshima. p. 14. ISBN 0-934878-94-3. This page is based on the Wikipedia article 1949; it is used under the Creative Commons Attribution-ShareAlike 3.0 Unported License (CC-BY-SA). You may redistribute it, verbatim or modified, providing that you comply with the terms of the CC-BY-SA.